Laity Told: "Be Part of a Miracle"
About 1,000 people attended the Laity Session, which met on the morning of June 1 prior to the opening of the Conference. 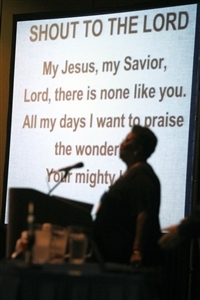 Graves, a member of First United Methodist Church of Melbourne and the Conference’s Associate Lay Leader, was the keynote speaker for the session. He challenged the laity to embrace their own call to ministry, noting that Jesus began with 12 disciples but within 300 years there were 20 million Christians in the world. “How did they do it? Their faith was illegal. There were no church buildings. They had no formal New Testament. There was no professional leadership. They had no youth groups, no seeker-sensitive worship services,” he said. 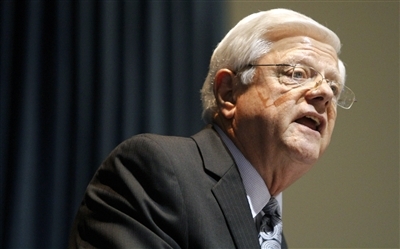 Similarly, Graves said, the church in 20th-century China experienced severe persecution, yet it grew from 2 million to 60 million members by the time the persecution eased. “Persecution under the sovereignty of God acted as a means to keep them in the true faith and reliant on God. The primal missional potencies of the gospel and the primal missional potencies of people was a miracle in the making,” he said. Graves said the Methodist movement had a similar energy in its early years, growing from 2 percent of the population in the United States in 1776 to 34 percent of the population in 1850. That presents a challenge to the current situation of the church, he said. Several speakers also addressed the session, including: Gretchen Hastings, director of Connectional Relations; Dave Sippel, director of Youth and Young Adult Ministries; Derrick Scott, a campus minister and director of Access 218, a program aimed at young adults; Mickey Wilson, Florida Conference treasurer; and the Rev. Robin Hager, pastor of Christ UMC in St. Petersburg, who spoke about the Shade and Fresh Water program that provides retreats and counseling for clergy, especially those experiencing difficulties.